This composite or masonite board was first sealed with a water based cement additive that is both added to the mortar (mistake; don't add a cement additive to the mortar) and applied to the dry support. The metal lath is attached with Gorilla Glue, wet with water so it expands over the lath. Another coat of cement glue and apply the mortar while it's tacky, (Failed). I'm using #16 large sand which is easy to push around into shapes in the lath. Crushed and sifted large grit limestone is better for the under coats because it's not smooth edged. Fired tile, cement board or 3/8th plywood is better but heaver. I really like that round end trowel. This is the finished second coat (intonaco) of mortar on top of the dry first coat (rough), and the red, yellow, white and green earth pigment test on it's second day. I'm making a batch of fresco wall painting blanks. Placing incised lines in the first wet brown coat is not a good idea, cracks can form from these lines. It's better to pull the edge the trowel over the surface, both taking off the hard surface lime and leaving a rough surface. A wet sponge does a nice job. I'm using a light composite board cut to size, use one that is waterproof. Painted on the back side with white latex primer, 2 coats. The cement side gets a coat of cement adhesive/bonder or latex paint as an insulator. Then I cut the metal lath and glued it to the board with Gorilla glue. Stainless steel staples hold it permanently. 3:00pm, intonaco finished. 1:1 lime and marble meal. Marble meal has no grain to it so it spreads like butter. Hmm.. this is the first time I've used pure marble meal, (Failed, you have to use a brush to apply it thinly. It's just there to absorb the paint one time. This is going to be a very white painting. A white pearlescent vase, a magenta vase and a light green bottle. 3:45pm, It's drying slower than intonaco with sand or crushed limestone in it, and I forgot to add alum to it. This might be a long night. 4:30pm, Still too soft to work on. I can tell by touching the edges, I smooth them with a touch of my finger, the mortar can't move or stick to it. 5:00pm, It's really close. I'm sure a soft brush point would still make a mark. I can tap out irregularities on the surface with the flat of my finger. Later, if I want to wait that long, I could smooth even more with the palm of my hand. Or as they did in days of old, paddle it harder and smoother with a roller. Question: What came first, the pizza roller or the fresco roller? Answer: Fresco roller.3,000 B/C the Old Kingdom Egypt was painting murals of miners, smelters, farmers and "the good life". I'm painting with raw sienna and Venetian white earth. It's still too soft, I'm leaving stroke marks that that have to be troweled out. 6:51pm, I can't believe how soft it still is, although it is absorbing well. It's exciting to work with three different whites and the pearlescent refraction's in the center vase. Tip; If your working with thin plaster, work your work horizontally so it wont run. 9:50pm, Two objects finished, the green bottle and shadows to go. It's absorbing just fine, the blending is going great. My answer; don't use marble dust, it's too fine. UNLESS, it's just painted on thinly as a last intonaco. 12:30am, it's still absorbing, but it takes 30 seconds. 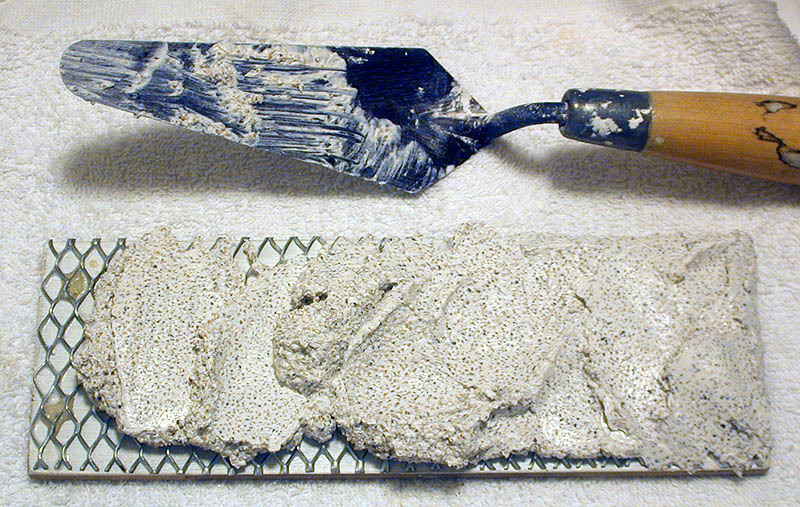 Board B, 02-26-04, B= 3x3, alum, glue binder, 1 limestone crushed and sifted for the larger grit, 1 medium #1-20 sand, 1 lime, 1:2. Test results have show not to use acrylic glue adhesive/bonder in the intonaco. USED in this test. Board D1, 02-26-04, #D1= 12x12, alum, glue binder, 1 limestone crushed and sifted for the larger grit, 1 medium #1-20 sand, 1 lime, 1:2 ratio. Board #D1, 4-7-4, 5:30pm. 1:1 intonaco finished, alum added. 11:45am, I learned something yesterday while going over the blue pigment and absorption tests. Now every color I put down has a little lime paste in it, starting with the drawing. The trick is to add lime, if you don't you're going backwards. Now that I'm adding lime cream I have a new tool on the table, my spray bottle. 12:00pm, second photo, starting to add colors, with lime in it. 4:30, every spot of paint has lime cream in it. I laid it down and sprayed it with water, nothing bled. I still have to fill in the holidays. 5:30, Finished, now wash out the lime in the brushes with vinegar, then soap and water, then conditioner. I can't wait to see any color changes since I added lime cream to every stroke. The colors used were, titanium white, quinacridone magenta, Thalo red, golden yellow oxide, Naples yellow, Thalo green, viridian, ultramarine blue, Thalo blue, green oxide and green earth. 9:30pm, it has a new crust on it, I painted on a couple coats of limewater and now it's absorbing very well. 9:35pm, maybe I don't want to stay up until 2:30 this morning. I'm making a box for all my fresco pigments and new colors are arriving any day. I must have the box ready. And.. I'm teaching fresco to a class of 7th graders next week so I'm making a few different sizes and shaped trowels out of plexiglas to save some costs, the students will make their own. I'll shoot a picture of them and make a page to link to. I made the drawing with green oxide and Quinacridone red. The board is very heavy with limewater. 2:07pm, I laid the panel on the floor and sprayed it twice, completely covering it with lime water. The background is a mix of ultramarine blue and vine black. 5:40pm, finished. The colors used were; Ultramarine blue dark, vine black, Quinacridone red, quinacridone magenta, yellow ocher, Cadmium yellow, viridian, green oxide, titanium white. Board E, 02-26-04, E= 9x12.75, alum, glue binder, 1 limestone crushed and sifted for the larger grit, 1 medium #1-20 sand, 1 lime, 1:2. On top of this I painted an acrylic cement bonder and laid a wet coat of 1:1. On top of that I covered it with medium dry sand and pressed it in. I'm looking for the best rough coat to put the intonaco on. This layer will not need to be dry sanded before soaking. READY for intonaco. Intonaco finished at 6:15, added alum to 1 lime 1 fine sifted limestone. 3/32 inch thick. I'm painting the same view as on Board A, Board A was 1:1 marble meal to lime and it cracked. The colors I'm using are: titanium white, Thalo green, viridian, quinacridone magenta, Thalo red, Naples yellow, cadmium yellow, light gold ocher, caput mortum, raw sienna, Italian white earth, Thalo blue and cobalt blue light. 7:15, 1 hour stand by time, it's ready. No dripping. 7:45, laid in. 8:05, Added thin white background around bottle and vases. Adding flowers and two more thin coats of titanium white. TIP: I use the same expensive sable brushes for fresco that I use for watercolors. To keep them soft I wash them in vinegar to dissolve any lime in them before washing them in soap and water. Board F, 02-27-04 F=12x12, lath coat with large sand. Rough added, no alum because the glue facilitates drying, glue, 1 large sand, 2 large limestone, 1:3. 3-24-4, Second rough, Sand back, add thin rough with small limestone and large sand, 1:2, nothing added. READY for intonaco. 8:45, The fast absorption has been continuos for ever. I feel it can go on for a long time. I have already gone trough more limewater then all my other frescos combined, I think. 9:30, I got my first smear while wetting down. Maybe it was because I had just put down some very dark colors. I'm taking a 10 minute break and wet it down again. It's still absorbing quickly but I think I have to stop wetting down and just paint. All my work is just sinking in. I shot a picture and wet it down again, yes color is sinking in too much. It may last for 8 hours or more doing it this way but what is the use? I have the painting pretty well laid out, from here till the end I am just going to paint, and most every thing will have to be painted again. Every color from here out will be more opaque, lighter colors will have lime paste added to the titanium white. 12:25 AM, Finished, the last color down was the whole background. The colors I used were: Naples yellow, titanium white, light gold ocher, Italian warm ocher, ercolano red, cobalt blue light, Thalo blue, caput mortum and verdaccio. I never my darkest color which would have been Thalo blue and Thalo red combined. Seven and a half hours of painting, I'm sure I could have gone to eight hours and more if I kept wetting it down. Buon Fresco. 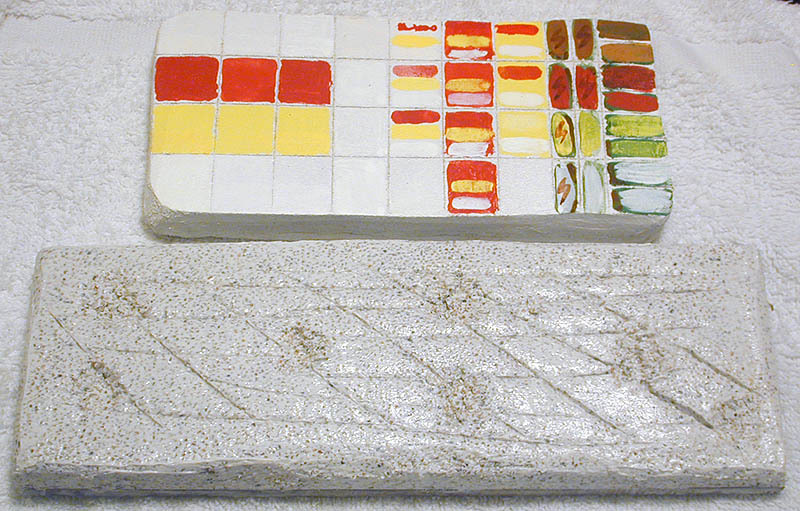 Board I, 02-29-04 I= 9x12.75, glue on board, glue in mortar, large marble and medium sand, 1:2. Test results have show not to use acrylic glue adhesive/bonder. New rough, READY. Intonaco 3-22-4, 6:15. On top of the rough I painted an acrylic bonding agent and laid the intonaco, 1:1 lime and crushed limestone. PAINTED SELF PORTRAIT #1, 63 years old. Start 8:45am, the mortar is still soft, I have to be very light with the brush. The colors are not absorbing yet but that's good for changing the initial drawing. The light is florescent, the colors I chose are: raw siena, Italian warm ocher, Ercolano red, Thalo red, Quinacridone magenta, Raw umber, cobalt blue light, thalo blue, titanium white. I shaped my beard, combed my hair, and I have to remember to smile. 10:00am, The mortar is still soft, the paint is just starting to absorb but can still be lightly remover. 10:20am, the first signs of a crust is showing up, from here on I will have to be making full color strokes, but they are not holding well yet. 11:30am, Blends are still hard to make, but I'm getting down big color. Strokes just won't hold yet. 11:50am, strokes are starting to hold but still leaving puddles at the end of them. They each have to be blended out. 12:20pm, It's happening, strokes are staying put. If my estimate is right, I've got two hours of great painting time left. 2:15pm, Finished. It's still absorbing after 5.5 hours of painting time. The mortar is soft enough to smooth out the sides with my fingers. 2:30, sprayed it with limewater. The local colors are in, cadmium yellow, cadmium red, veridian, next the shadow colors. Turquoise is the opposite of this red scarlet pepper, I don't have a turquoise, thalo blue and thalo green mixed will do. The green pepper is on the cool side, making the opposite shadow color scarlet. The yellow pepper is glowing warm within, just like the Vesuvianite crystal which is like the pigment Indian yellow orange side. A color I can't get dry. The powers that be don't deem it important enough to sell. I do have the brown side though, and cadmium orange so it's Ok. This is #57, a Silicate Vesuvianite crystal. ALUMINUM, yellow, transparent, standard #1 [YYYY], and blue, transparent, standard #7 [MMCC], opposite colors that center to neutral. Crystals in the tetragonal system, some masses in the orange or azure range. By centering yellow to brown, the three analogous colors of this gem, yellow-green, yellow and orange go to brown. On the other side of this analogous range is blue, blue crystals were found in Norway. Idiochromatic. 5:15, brush it down again. The peppers and shadows are finished. It looks good with a white background. 4-10-4, 4:00pm, It's been setting with the intonaco finished and wet for more the 24 hours. I just washed off the calcium carbonate crust and painted on some new lime cream. 5:00pm sprayed with lime water. 6:05, sprayed again, I'm adding 20% titanium white to lime cream to mix with all my colors. 7:40, spray, I'm getting close to the end. Add some definition to the flowers. 8:47pm, Finished. Lime cream added to every stroke. The colors for this painting were: titanium white, Naples yellow, Venetian white earth, raw sienna, Thalo red, quinacridone magenta, Viridian. Cracked because of uneven intonaco over 1/8th inch. Board M, 02-29-04 M= 12x12, glue on board mortar applied into wet glue, glue in mortar, small sand and unsifted marble, 1:2ratio. Test results have show not to use acrylic glue adhesive/bonder. Board M, 3-20-04. Scrubbed it down, painted on some skim milk and put a 1/8 inch intonaco of crushed limestone and lime, 1:1ratio. Plumerias and Bananas. Cracked, because of uneven intonaco. It reached 3/16th in the middle, 1/8 is max. Board O, 02-29-04, O= 8x12, glue on board mortar applied into wet glue, glue in mortar, small sand and unsifted marble, added a little lime water to make it sticky, 1:2ratio, Next day started to crack. Board O = 8x12. 9:00am, 03-13-04, Intonaco test added to Board O with the base coat scrubbed like the Bird of Paradise fresco, which didn't crack. The new intonaco coat with 1 lime and one fine crushed limestone, has had large and medium sand added to it. 1:1:1.5. The base coat was hard scrubbed and adhesive/bonder painted on before the intonaco was applied, just like the Bird of Paradise. Board O, 6 hours after I put on the top coat. During the daytime five hours is enough time for the mortar to lock up. The cool night seemed to prolong the setting time, it doesn't have to be humid, just cool. 3-17-04, The Fruit and Red Flower fresco is my best fresco yet, no cracks and the carbonate crust has formed beautifully. Board P, 02-29-04, P= 12x12, glue on board mortar, board mortar has metal lath in it. Glue in top coat mortar, small sand and unsifted marble, added a little lime water to make it loose and sticky, 1:2ratio. When this is dry I sand papered it with fine #220 wet-dry sandpaper to remove all the shiny carbonate crust. Soak it in water until it stops bubbling and adding a last coat of skim milk before adding the loose preparatory coat of lime and large and small sand. READY for intonaco. Board Z1, 02-24-08, Z1=12x12, alum, large sand, glue binder, 1x1, 3-24-4, sanded the back to the board, they were buckling when just the front got water. Soaked the board, painted on casein, and laid on a large and small sand thin rough with casein added. READY for intonaco. Board Z1, 4-5-4, 2:00 PM, finished intonaco at 3/32", 1:1 lime and crushed limestone, alum added. Board Z1, 4-7-4, 5:00pm. Fifty hours after laying the intonaco, having covered it in plastic and wet newspapers, I sponged off the top crust. This is a big step forward, controlling the drying time and removing the crust. The mortar was hard enough to be able to just remove the calcium carbonate and the top layer of lime. It's still a smooth surface. When all the water had absorbed, I painted a coat of lime cream. Yellow and blue are complements. 6:40pm, the drawing is finished and the back has a fairly even layer of color. It's absorbing well. 9:30, finished, it's still absorbing paint well. Four and a half hours. The colors used were; titanium white, Naples yellow, cadmium yellow, gold yellow ocher, Indian yellow, cadmium orange, thalo blue, ultramarine blue, cadmium red, burnt umber. Two days later all the boards warped.. Just a little. Use fired tile, even cement board, but not the shiny cement board, anything that will break before it bends. 3/8th plywood works up to 2ft x 2ft. 3/4th inch plywood makes up to 4x5 foot. My PoL forum friend Steve insulates the board from the lath and mortar with a roofing paper. Two months later the boards straightened out, by themselves. I shouldn't have put glue in the rough coat mortar, that makes it waterproof and it won't hold water for the intonaco coat. All boards received a new rough coat to level them out and be more receptive. 3-16-04, Tile #1, Yesterday, at 6:30pm I put a top coat only of 1/4 inch thick, 1:1 small sand and mortar on a 12" fired tile that was sealed on 5 sides. I call that Tile #1. At 12:30am last night I went outside and noticed the mortar was still very soft. This is the second night I noticed this. I put it in the refrigerator at 12:30am in hopes of it staying soft and being able to paint on it the next morning, today. 3-17-04, PAINTED Tile #1, 12"x12" is called, Bananas and Yellow Flowers. 3-18-04, Tile #1 cracked in the middle where it was thicker than 1/8 inch. 3-17-04, Tile #2, 12x12 inch, bonder in mortar, 1:2 lime and large and small sand. This first layer was loose mortar and less the 1/8 inch thick. 3-19-04, 12:45pm, Tile #2, 12x12, Wet the tile, paint on skim milk on top of the first coat of mortar (I forgot to scrub it, if it cracks, that's the reason), 1:1 lime, crushed limestone less than 1/8 inch thick. 1/4 teaspoon of alum added. 3-19-04, 12:45 PM, Tile #3, 12x12, Testing what medium to put on a wet tile before adding mortar. Top Left - Skim Milk, Top Right - Casein, Bottom Left - Acrylic Adhesive/Bonder, Bottom Right, Water only. 1/4 teaspoon of alum added to the mortar. 3-22-4, NO CRACKS, 3-30-4. READY for intonaco. 3-18-04, Tile #4, broken, small half of tile. On the left, skim milk on the tile, 1:1 lime and fine crushed limestone. On the right, acrylic adhesive/bonder on the tile. three hours later the right side was cracking but the left side didn't. Thirteen hours later the skim milk side still had no cracks. Tile #4, broken, large half of tile. Thin layer of loose large and small sand with lime, 1:1 with binder added. Before this was completely dry I added a second layer of crushed fine limestone and lime, 1:1 with skim milk added to make it a loose mortar. The two layers together equaled 1/8 inch. The skim milk makes a much higher gloss then the smaller broken half. 11 hours later I PAINTED on some colors, 3 days later I washed the tile, the colors are holding and the gloss is still there and doesn't rub off like it did the second day. 3-30-4, small hairline cracks, don't add skim milk into the mortar. I haven't tried painting it on the intonaco, it may just add gloss, it does add gloss to the pigments when added to the limewater. 4-13-4, both sides are cracked. Don't add anything into the intonaco. Tile #5, Skim milk painted on tile, thin layer of loose lime 1:1 large sand. 8:00pm, 4-3-4, finished 3/32" intonaco layer of 1:1 lime and small crushed limestone, alum added. I set the tile on wet newspapers for the night. 4:30pm, 4-4-4, I washed off the crust a little differently on this Tile #5 than on #6. Tile #6 I let soak and the crust flaked off but the intonaco got softer. Today's Tile #5 I started with the sponge as soon as I got it under water, very lightly I sponged off that top layer of lime that forms when toweling a smooth intonaco. It came off on Tile #6 also, along with the crust. I will paint on another layer of lime cream on the horizontal surface and let it soak in. It's probably not necessary but I like the smoother surface. Be sure you wash off all the loose sand, you won't get another chance to brush it off dry. I went shopping for subject matter this morning after dreaming of a green fresco. I'm going to get to test all my green pigments. Thalo green is the toughest on to work with, I have to keep the pigment wet or it hardens like Pozzuoli red (a natural cement), quinacridone magenta, titanium white and Thalo blue. Thalo green is hard to grind in water, even after dissolving and solidifying it in alcohol. No Problem. On my next fresco I want to figure a way to just remove the crust and leave the lime surface be. 6:30am, ready. Drawing with green earth, shot photo to show drawing and surface texture. It's much rougher then my other frescos. After drawing I painted on two coats of lime water and took a brake. 6:45, I painted it a solid color background with Thalo green, lime paste and titanium white. Now I'll paint it the background shadows. 7:20, the background is finished. Thalo green, quinacridone magenta, Thalo blue and chromium green oxide, titanium white and lime white. Because of my friend Steve Ladd's suggestion for using bristle brushes, Steve is making an ultramarine blue in lime paste test right now, and the fact that this new technique has a harder intonaco because it has set for 24 hours.. I'm painting this fresco using synthetic bristle brushes. they are working just fine. I wet the fruit with lime water and am taking a 5 minute break. 8:20pm, the top three fruits are finished, I wet down the bottom 3 and am taking another break. 9:30, finished, the synthetic bristle brushes worked great, the rough surface was a relief and I enjoy it. The colors used were: Thalo green, quinacridone magenta, Thalo blue and chromium green oxide, cobalt blue light, light gold ocher, titanium white and lime white. Tile #6, 3-17-4, Skim milk painted on tile, rough thin layer of large sand. 4-1-4, 6:00pm, soak tile for 3 hours, add alum to small crushed limestone 1:1 lime. A 2.5 inch square of mortar covers 12 square inches of mural, it took a hour and a half to lay it down. 9:00pm, still too wet, perhaps I'll try something I've read about but never had any conformation on, paint on it the next day after washing off the shiny crust and adding limewater before painting. I have noticed that the crust slows down the drying process. 4-2-4, 9:00am. It's hard to believe what has happened. I re-soaked the tile for two minutes, wiped the surface with a soft sea sponge under water, and the calcium carbonate crust came off in flakes! Amazing! I have it out of the water right now, absorbing the surface water. Then a couple of coats of lime water soaked in and I'll paint. The surface is harder then I'm used to having to paint on. I'm very excited. Nowhere that I've read has explained this phenomenon. It's taking fresco to a new level, along with Indian yellow synthetic, Thalo red, Thalo green and quinacridone magenta. Thalo blue already had the green light but no one suggested grinding and storing it in alcohol and letting the alcohol dry out on the palette before adding limewater. Indian yellow is the only synthetic color I store in water. No one has suggested adding a little industrial strength ammonia to all the earth colors to keep them from forming mold inside the wet storage jars either. 10:40, Now that water has soaked in I can see the shiny spots around the edges where I didn't get the crust off. I'm re-soaking it again. The intonaco is more fragile in this second soaking, be careful. When this water soaks and it's dull I'm applying a coat of lime milk #5, made from lime cream. TIP: Lime milk #1 is as fluid as milk, milk to the consistency just before it will hold a peak is lime milk #5, this is what I add to pigments. Cream will hold a round peak, putty will form a solid shape. 2:00, the surface is dull, it's ready to paint on. 3:13pm, painting very well. I'm keeping it wet down because I multi-tasking and haven't gotten very far. Right now I'm thinking "this the way to do fresco". 4:10pm, this is painting so nicely, I get to take lunch breaks, cigarette breaks, It's still absorbing perfectly. Absorbed colors aren't moving when I put lime washes over them. It's been over 21 hours since I applied the intonaco. 5:40pm, I'm still pushing, pulling, adding and removing colors new colors that haven't soaked in yet, all over the fresco. This is the most fun I have had on a fresco and the only way from now on. This is also my best fresco yet as far as technique is concerned. 6:35, finished. It could have gone a lot longer. Six and a half hours painting, twenty four and a half hours after laying the intonaco keeping it wet. Tile #7, broke. Skim Milk painted on, added a thin layer of large sand to both pieces. Small side, Gymnast Head. Both layers together are separating from the tile at the top edge, maybe the tile wasn't wet enough. Tile #8, 3-17-4, Skim milk painted on soaked fired tile, 1/8th inch thin layer of lime and large sand. Rough ready for intonaco. 7:00am, 4-1-4, Intonaco mortar made, alum was added. I think the alum added saved this fresco from separating from the tile like Tile #7 small side. 8:00am, Lime paste, zinc white and Thalo red background. I wanted to test a new large mural sponge also, not happy. It scratched the surface and looked like a big ugly brush stroke, Now I have to live with it and keep the whole mural really loose. That plus the big change in color as it soaked in and I lost 90% of my drawing. I went right over everything including my light green mangos with Thalo red. I'm jumping back to titanium white and lime cream like a scared bullfrog. Loose, I have to think fast and loose. Big brushes, big strokes. The background has gotten 200% lighter as it's sinking in. At least that's following plan. 9:30, I still have three and a half hours left, I hit the mangos running, the yellow green has got to cover the red. I'll give it a half hour to sink in an cover it again. 9:40, The light green sank in fast, another coat. 10:30, the mortar is at it's finest right now. Quick absorption, when I add lime water and I can move the colors color around. 12:00, finished. Four hours of painting. The mangos turned out fine, two coats of titanium white 1:1 with lime cream and chromium green oxide covered the quinacridone red and zinc white with ease. The colors used were, viridian, chromium green oxide, quinacridone red, Thalo blue, cobalt blue light, Naples yellow, zinc white, titanium white. Tile #9 broke. Small side, thin layer of large and small sand almost dry, second, a thin layer of crushed limestone, added alum. No problems. Tile #9 broke. Large side, thin layer of large and small sand. Intonico, 3/32 inch thick, soaked 2 hours, skim milk on top. 3-30-4, Testing Thalo blue, ultramarine blue, cobalt blue deep, cerulean blue, with titanium white and lime white. Combinations of each in 5 columns, each column has another pass of color. This is a test for lime fastness and absorption times. 09:20,0929,1101,1150,1240,Line 1, Thalo blue and limewater. 0922,0932,1102,1151,1234,Line 2, Thalo blue + lime cream. 0925,0934,1103,1152,1244,Line 3, Thalo blue + titanium white + lime cream. 0927,0936,1105,1153,1246,Line 4, Thalo blue + titanium white. 0948,1029,1109,1206,1248,Line 5, Thalo blue + Ult. Blue + limewater. 0949,1030,1109,1207,1250,Line 6, Thalo blue + ult. blue + lime cream. 0950,1031,1110,1210,1253,Line 7, thalo blue + ult. blue + titanium white + lime cream. 0952,1035,1111,1212,1254,Line 8, thalo blue + ult. blue + titanium white. 1000,1036,1119,1217,1255,Line 9, Thalo blue + cobalt blue light + lime water. 1002,1037,1121,1218,1256,Line 10, Thalo blue + cobalt blue light + lime cream. 1003,1038,1122,1220,1257,Line 11, Thalo blue + cobalt blue light + titanium white + lime cream. 1005,1040,1124,1222,1258,Line 12, Thalo blue + cobalt blue light + titanium white. 1007,1042,1125,1225,0102,Line 13, ultramarine blue + lime water. 1008,1043,1126,1226,0104,Line 14, ultramarine blue + lime cream. 1011,1046,1129,1229,0108,Line 16, ultramarine blue + titanium white. 1015,1048,1131,1230,0111,Line 17, cobalt blue light + lime water. fast pick-up, slow absorption. 1017,1049,1132,1231,0112,Line 18, cobalt blue + lime cream. 1020,1051,1133,1233,0112,Line 19, cobalt + titanium white + lime cream. 1021,1053,1135,1235,0116,Line 20, cobalt blue + titanium white. Thalo blue + lime cream, 0119, Ult. blue + lime cream, 0123, cobalt blue light + lime cream, 0127, titanium white + lime cream, blank. Six hours of painting time, too long.. I'm glad if have each boxed color's time. Tile #10, Skim Milk painted on, Large and small sand with alum layer. READY for intonaco. 3-30-4, 5:25 intonaco finished, alum added to small crushed limestone and lime 1:1. 3-18-4, Plywood #2 is also 12x24 with metal lath. First a layer on the lath, dried. Second, a rough coat with normal mortar 1:1 lime and sand. Third layer, a thin layer of 1:2 lime and small and medium sand, before this was completely dry, 1.5 hours, I painted a coat of acrylic adhesive/binder on it and toweled on the forth layer. Forth layer, a loose top layer 1/8 inch, 1:1 lime and sifted small crushed limestone. 7:45, finished fresco Little Gymnast. Titanium White mixed with lime paste was the last color down. 3-19-04, although this fresco did not crack, I was lucky. Skim milk gives better results. TIP: When you use just lime water and pigment, soap will clean the brushes. When you use lime milk or paste in your pigments, use vinegar to clean the brushes, then soap and water. Thin Tile 8x8, 4-7-4 #1 of 11. 4-11-4, Thin Tile #1, Intonaco at 3:00, I left it uncovered until I paint tomorrow. 4-12-4, 5:00am It was too hard, perfect, but too hard. I soaked the whole tile and rubbed off the top layer and it left it really rough. Too rough for me. I should have just let it soak until the crust separated. 5:30 -7:00am, added another layer of 1:1 intonaco with alum. I could have just covered the top with pastic seran wrap yesterday, than I would be painting now. This is the fresco I am going to test with acrylic as the medium instead of limewater. 9:00, too wet to work on. 9:20am, It happened fast, already a crust was forming that beaded water. It took a lot of strokes with limewater to break it down. I'm ready to start. 1:15pm, finished. This work is all about contrast and using an acrylic concrete sealer as a medium in lime. It painted well, absorbed normally and kept bright colors. The first color down was ultramarine blue, it never lost it's brilliance, nor did any other color. Right now the mortar is still wet enough to move with a finger's touch. The acrylic sealer is still wet right along with it. The white signature went over the blue with ease. I expect it to dry normally also. They were all made in one day, 4-27-4, with stick levelers. That cut the time in half from using a trowel. Tile 4-21-4#1, 1:2, 1 lime, 1 mixed limestone, 1 large limestone. Tile 4-21-4, #2, 1:2, 1 lime plus 1 mixed limestone, 1 large limestone, alum added. Tile 4-21-4#3, 1:2, 1 lime, 1 mixed limestone, 1 large limestone, alum added. Tile 4-21-4#4, 1:2, 1 lime, 1 mixed limestone, 1 large limestone, alum added. Tile 4-21-4#5, 1:2, 1 lime, 1 mixed limestone, 1 large limestone, alum added. Tile 4-21-4#6, 1:2, 1 lime, 1 mixed limestone, 1 large limestone, alum added. Tile 4-21-4#7, 1:2, 1 lime, 1 mixed limestone, 1 large limestone, alum added. Tile 4-21-4#8, 1:2, 1 lime, 1 mixed limestone, 1 large limestone, alum added. Tile 4-21-4#9, 1:2, 1 lime, 1 mixed limestone, 1 large limestone, alum added. Tile 4-21-4#10, 1:2, 1 lime, 1 mixed limestone, 1 large limestone, alum added. Tile 4-21-4#11, 1:2, 1 lime, 1 mixed limestone, 1 large limestone, alum added. New box of 12x12x1/4, 4-23-4, Box 3, Lahaina. 4-23-4#1 of 11, 1:2, two limestone. heaping tablespoons of white cement. New box of 12x12x1/4, 4-24-4, Box 4. 4-24-4#1 of 15, 1:2, two limestone. rounded tablespoons of white cement. These are the pages all the Panel Boards and Tiles are painted on. They open in a new windows. Basket of Pink Flowers #2.